Christmas and birthdays. They always lead to more presents and more stuff for the kids that you don’t have room for in your house. What’s another alternative? 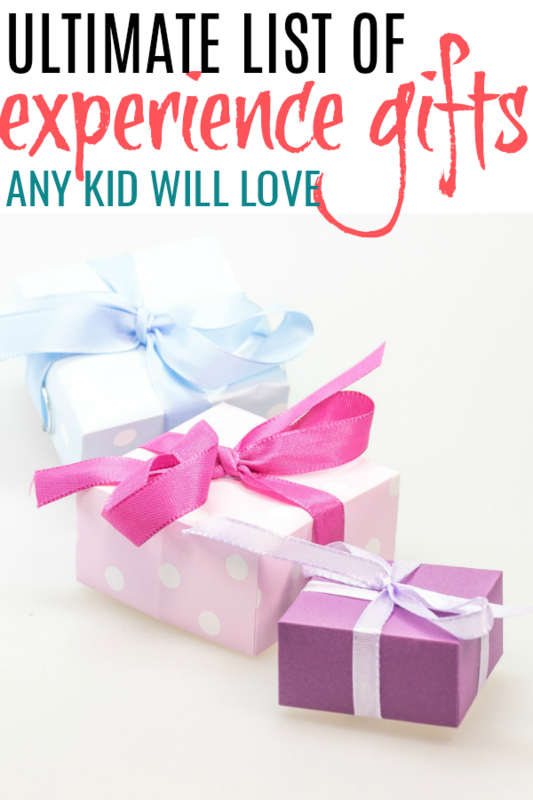 Experience gifts for kids! Affiliate links are used in these posts. Read the disclosure page for more details. 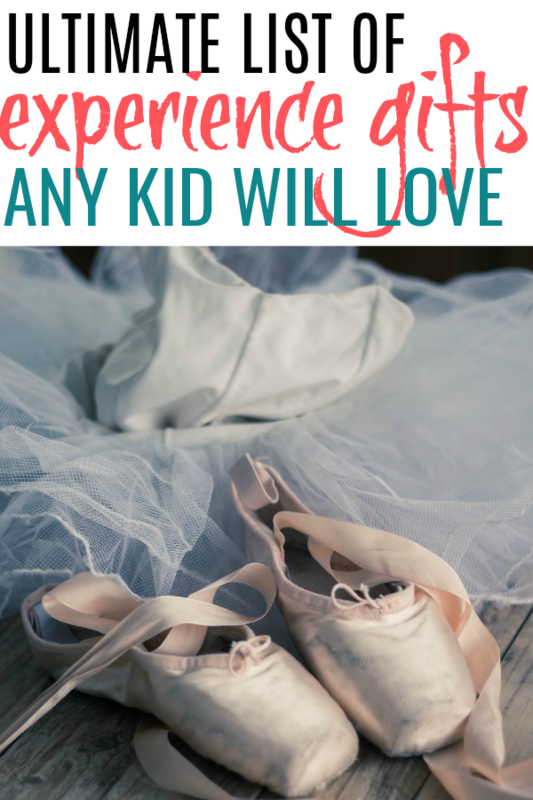 Experience gifts mean not only no clutter but your child gets to make memories and do something they normally wouldn’t. 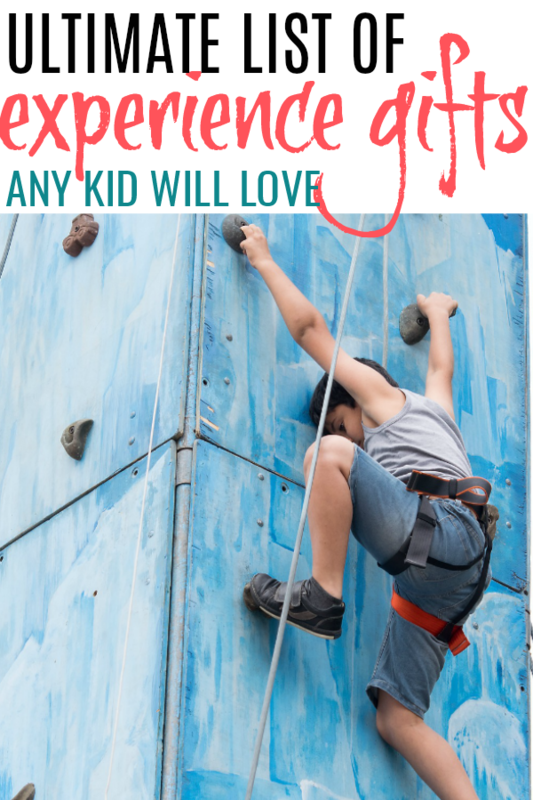 Coming up with the perfect experience gifts for kids can seem overwhelming, but it doesn’t have to be. Here is a great list to get you brainstorming. You will find something perfect for your child. Not only are experience gifts great for parents to give a child, they would also be a lot of fun to receive from a grandparent. If you are worried about how this idea will work not having a gift under the tree or at a birthday dinner for them to open, there are a couple of easy options. Make up a certificate/letter with all of the details (use pictures for younger kids) and print in color. Place that in a box or gift bag and wrap like you would a present. Come up with a small gift that goes along with your experience gift and wrap it along with a note. Or wrap the small gift and note separately, having them open the physical gift first. If your home is anything like ours, a trip to the movie theater only happens once every couple years. How fun would it be for your child to receive a ticket to a movie they would love. You can also do a bundle with tickets to a few other movies coming out the next year. Small Gift Idea: Popcorn or movie theater candy. The science museum and children’s museum are always a hit! Consider a day pass or even a season membership to a local museum. Small Gift Idea: A book about science. Once again, you could do a gift of a day trip to the zoo or a year membership. My aunt and uncle took my sisters and me to see the Nutcracker when we were kids. Such a special trip. Dress up fancy and take your child out for dinner before hand and they will feel like royalty. 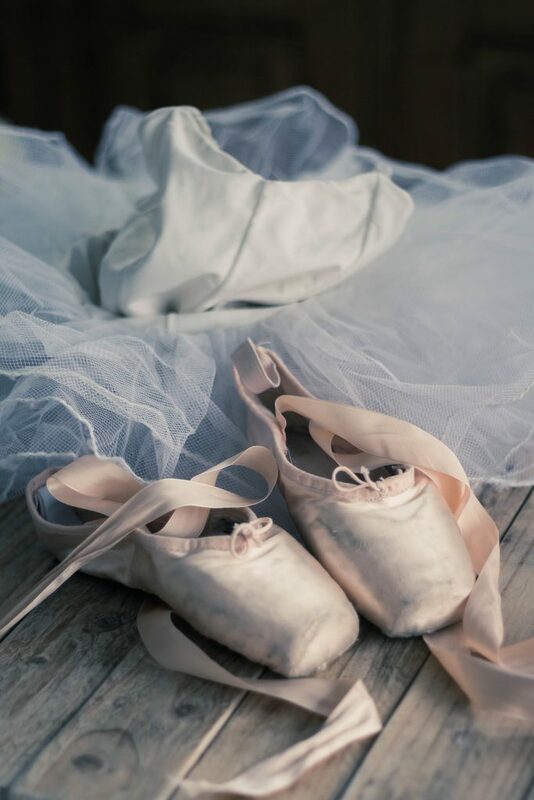 Small Gift Idea: Book, movie, picture of the ballet or a dress to wear. Maybe you have some musical lovers in your house. Getting to see a favorite Broadway show live in your nearby big city could even be a favorite gift for a teen. Small Gift Idea: Book, movie, poster of the show or a dress to wear. Maybe sports are more down your kids’ alley. Whether it’s a college basketball or football game or going to a minor (or major) league ballpark, this would be a memorable outing with your child. The little girls in your family would love this. How fun would it be for them to dress up and experience a tea room and scones and other pastries?! Put together a bundle of monthly (or you could just do quarterly) dates with mom or dad. Come up with a fun selection and write them down on separate cards with all the details and have each redeemable in a specific month. Adventurous kids? They would probably love a certificate to the local climbing gym! Horses are expensive. If you have a horse lover in your house they will probably think this is the coolest gift ever. What child doesn’t like ice cream? Again, if this isn’t something you normally spend your money on, trips to the ice cream shop when your child wants would be very enjoyed. My son loves trains. He’d be over the moon knowing that his presents was going to be riding on a legit train. Small Gift Idea: Book on trains or a toy train. The options here are countless. Look to see what is offered in your community and compare that list to the interests your kids have. Small Gift Ideas: Any little gadget or accessory that would go along with your class of choice. Another great idea for the adventurer in your house. If you have a child that loves dolls, a trip to the American Girl Cafe and store could be a special experience. Again, if this isn’t something you normally do your girls will feel pampered. Whether it’s a special hair cut or getting her nails done, she’s sure to feel special. What are your favorite experience gifts for kids? Have you seen unique ideas for gifting them before? 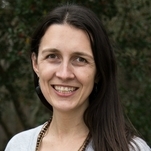 This entry was posted in Uncategorized on October 1, 2018 by Deanna Michaels. I love your list of experience gifts. The memories these gifts will give will last a lot longer than any toy could. Thanks to your post, I am inspired to put a few of these types of gifts under the tree this year! Yay! Thank you so much. I’m excited that you are going to try a few experience gifts. I struggle to come up with “things” that my kids want/need that aren’t junk so these are perfect!